Skiway Lodge, is a traditional lodge located just below the Skyway Skiway on Ski Hill Road Breckenridge, Summit County, Colorado. Although the Skiway Lodge condos for sale are legally divided into studio and one-bedroom condos, all are under the same ownership, and was formerly known as the Hunt Placer Inn, prior to construction of the skyway. Skiway Lodge offers rooms or one-bedroom suites - all but one have a private balcony - and offer common amenities like hot tubs, an outdoor firepit and a common dining area available to guest. But the Skiway Lodge is most notable for being a hometown kind of place with the owners as on-site hosts. Discover available Skiway Lodge condominium listings below, or find out more about the surrounding community. 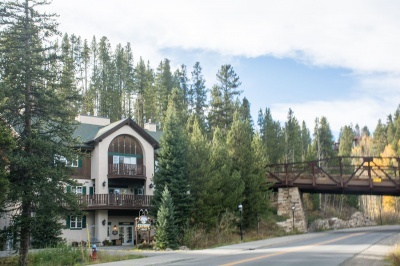 Before the skyway was constructed, this lodge was known as the Hunt Placer Inn, for the historic mining claim, and the owners came up with creative ways to get the word out about their lodging property. They held Mystery Dinner Theatre and housed the Backstage Theater when the theater was in limbo between the old space at the Village and the Breckenridge Theater that now exists on Ridge Street. The Skiway Lodge is just a short walk to the town and ski area shuttles, which are easy ways to get to the base of the lifts. The Breckenridge Main Street shopping and restaurants are only two blocks down Ski hill Road. Just outside of the Skiway Lodge is the Breckenridge Historical Society historic mine and mill on the old Hunt Placer site. From here, it’s a short hike up over to the Four O’clock trail and access to national forest. Size: 214 sq. ft. to 503 sq. ft. Amenities: on the skiway from Peak 8, walking distance to downtown, but slightly above it, on a good paved sidewalk, with access to national forest trails. Hot tubs, common dining area available. From the traffic circle on the north side of Breckenridge exit onto Park Avenue and continue about .5 mile to Ski Hill Road. Turn right and just before the Skiway crosses the road, turn left into Skiway Lodge’s parking area. Take the first step in your home ownership journey. Send us a message today!